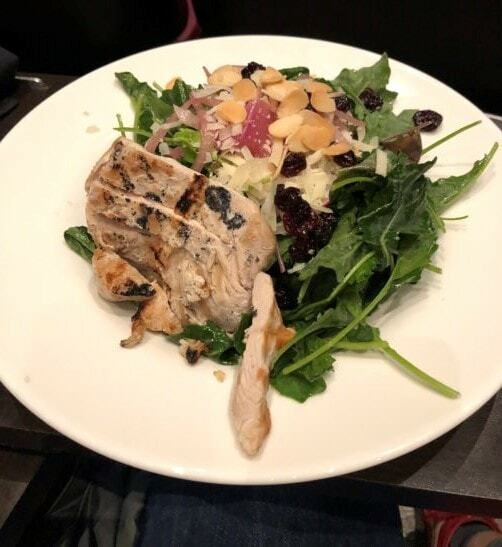 The kale salad with grilled chicken at Cinebistro. Here’s the scenario. We are at a restaurant that, say, has TV screens playing sports, the kind men like to watch. The tables are bare. The napkins are rolled around the silverware and of an easy-care synthetic cloth. Somewhere on the menu is a “bacon ranch,” a “honey chipotle” or “chili-lime” something-or-other. America’s favorite flavor cliches reign supreme. Which begs the question: Can the kitchen staff can actually pull off a perfectly cooked fillet of beef with a green peppercorn sauce? At times like these, hubby’s philosophy is to get the hamburger. It’s safe. The menu at Cinebistro Brookhaven, for example, comes to mind. It has a Korean cauliflower with a pineapple kimchi. It has a chicken with a spicy quince paste and guava sauce. Kimchi? Guava sauce? Korean? Seriously? On a recent visit, it seemed time for another burger. But both hubby and I would be rounder than we are now if we always went with the burger route. This time we had salads. Hubby took the biggest risk by ordering the sesame seared tuna salad. This is not a restaurant at which the server asks how you’d like the tuna cooked. It came “perfectly adequate,” hubby says. High praise indeed. I played it safer and ordered a kale salad with chicken breast. The salad came with almond slivers, dried cherries, sliced radish, pickled red onion and a kind of sweet pecorino vinaigrette. The chicken was obviously precooked and a bit dry. And pecorino vinaigrette? Huh? Wha? Where? Maybe I should have ordered that hamburger. We are going to see a movie at the Midtown Art Cinema in Atlanta. The closest restaurant is Apres Diem, right outside the door. Time for a salad, right? The menu has the same choices you see nearly everywhere: nicoise, Caesar, Greek, spinach. But then lo and behold: dried fruit? Whoa! Hat’s off to them for trying. I went for the unimaginative Greek. 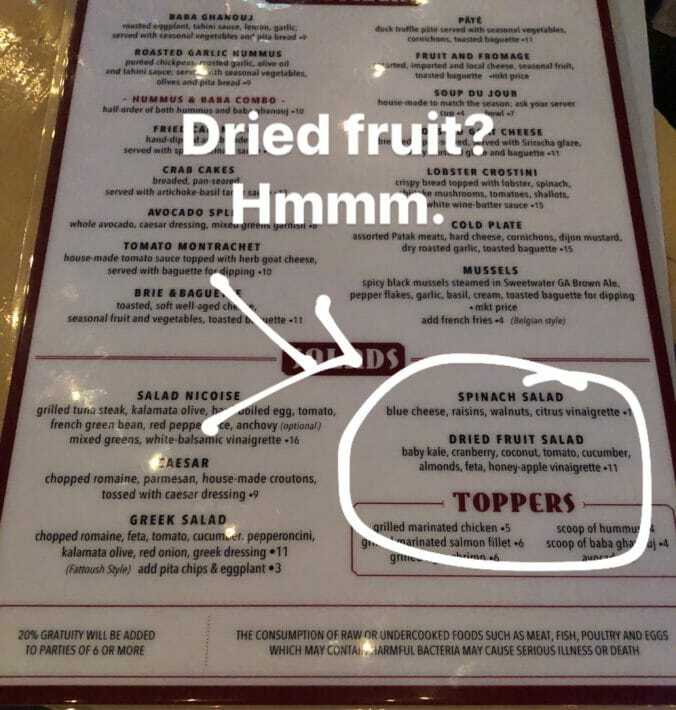 The dried fruit sounded a little too sweet. But you might be more adventurous and enjoy. I’ll have the salad with grilled chicken breast. Revival's family style side dishes were duck fat roasted potatoes, greens, mac 'n cheese, celery root souffle, beens and rice. The only way to eat mindfully at Decatur’s Revival is to eat light the rest of the day. This is not a restaurant with a lot of light-and-healthy choices. It’s a splurge, and a really good one at that. Revival is an interesting name for this restaurant situated in an old Decatur home just off the downtown area. It’s been the location of at least two failed restaurants. This effort seems likelier to be successful. It’s by Chef Kevin Gillespie, who also owns the new American dim sum restaurant Gunshow in Atlanta. The inspiration here isn’t the unlucky building, though. The name comes from the Sunday suppers of Gillespie’s youth. It’s southern with all the trimmings. Diners can order a la carte from the menu, or choose their own entries as part of the family style dinner for $42 a person. Family style includes entree, the sides and choice of dessert. We chose family style, and it was a lot of food. 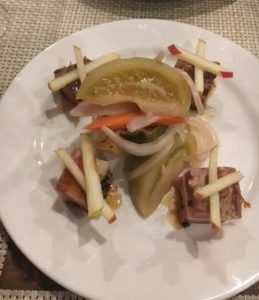 The amuse bouche was a pork belly — I gave mine away — with pickled green tomatoes. The salad, if eaten alone, would have been a pretty healthy choice. 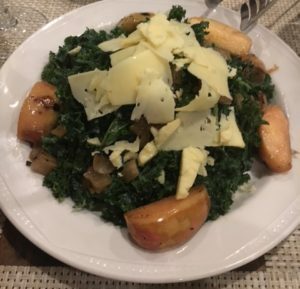 It was kale, lightly bruised in a dressing of cider vinegar and egg, with apple chunks, pickled onion and locally sourced Thomasville Tomme cheese. 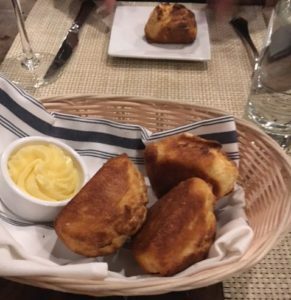 It came with exceptionally tender corn bread and honey butter. Of course I had one. Two of our number had a juicy pork chop; the third the duck and I had the fried chicken. I limited myself to the one small breast piece, and gave away or left the rest. 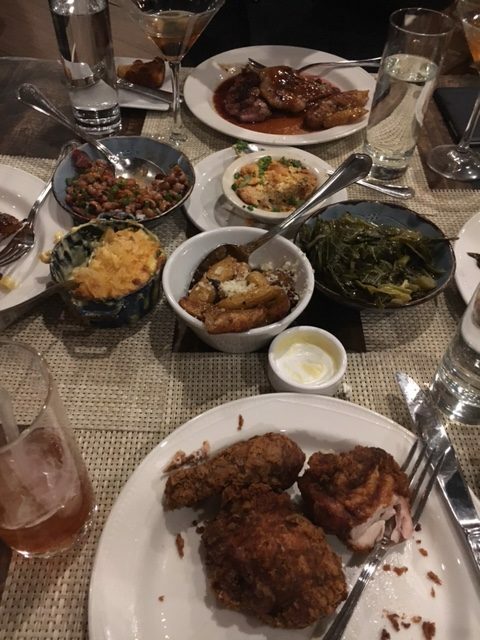 As with any southern restaurant, the sides starred as much as the main courses. The beans in the beans-and-rice were firm; the flavor and texture had not been cooked out of them. The mac ‘n cheese was gooey good. The greens were smoky and rich. For dessert, three of our group had the fried apple pie with vanilla ice cream. The pastry itself was buttery, flaky, wonderful. I had a ginger cake with cream cheese ice cream. The latter is a strange flavor by itself, but it worked well with the cake. 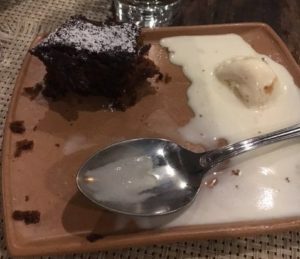 I tasted both desserts, enjoyed them, and shared or left most of mine. That’s the secret to eating here. Leave some to take home, share with companions or consign to the food recycling gods. Vegetarian and vegan restaurants evoke thoughts of healthful plant foods and grains, if not Birkenstocks and skinny people whose thighs are no bigger than my wrist. If you’re watching your weight and looking for that kind of vegetarian restaurant, Cafe Sunflower, with locations in Atlanta and Sandy Springs, is probably not for you. It is a wonderful restaurant that elevates vegetables to a sinful delight, and you are just as likely to get fat eating there as not. Like Dirt Candy in New York City, the extensive menu reads and tastes decadent. OK, not the best welcome, but I learned later from the server that the cooks do indeed hightail it out after the end of the lunch service at 2:30 p.m. Dinner begins at 5 p.m., presumably with a second crew of cooks. Their hasty departure did not prevent them from serving me a lunch that, while vegan, was sumptuous. Just imagine: those two words together in the same sentence. The starter was a beet carpaccio. Thin raw slices were arranged on a long, rectangular plate with squiggles of superfluous sauce on either side. 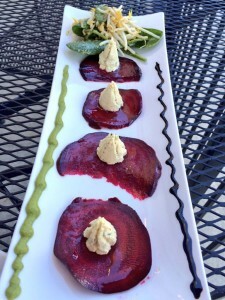 On top of each beet slice was a dollop of cashew cheese. The combination was wonderfully rich and didn’t seem affected one way or another by a smear of the sauces, described as olive pesto. I couldn’t find a listing for cashew cheese, so I assessed 6 Weight Watchers SmartPoints for 2 tablespoons of cashew butter. The entree was filling enough that a starter wasn’t really needed at all. 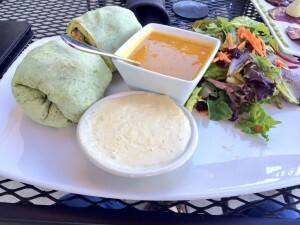 A large spinach wrap was stuffed to capacity with quinoa, spinach, zucchini, mushrooms, mashed sweet potato and avocado. It nudged the edge of pool of chipolte aioli, and the small dish of a vegan cheese came on the side, as requested. It was accompanied by a small cup of earthy butternut squash soup and a green salad with a bright, ginger dressing. Even without the cheese, the burrito was thick and rich. 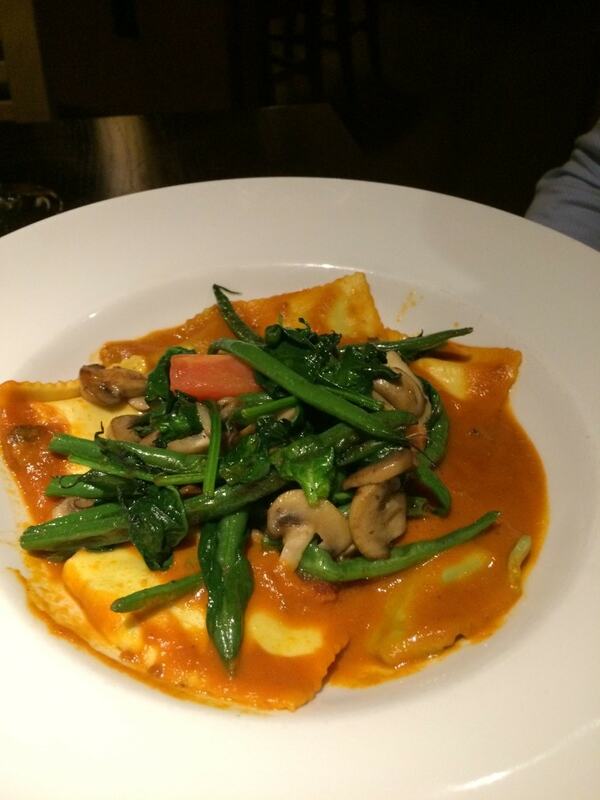 It didn’t look shiny, as if the vegetables had been bathed in an olive oil. But what was inside felt undoubtedly substantial. This clocked in at 6 smartpoints for a cup of quinoa, 5 for a half an avocado, 6 for the spinach wrap. Even with no visible fat, it seemed wise to throw in another 3-4 smartpoints to cover that potential plus the couple of times the burrito hit the chipolte aioli. For lunch, 26 is a substantial expenditure of points. Too much, really. Half the burrito would have sufficed. The Restaurant Dieter paid for it, too. The whole affair called for a nap that ended with heartburn — a rare event when I’m eating light and healthy. All the contributing factors were probably at play: the position of the lower esophageal sphincter when laying down, too much food, meals high in fats and oils (animal or vegetable) and likely, garlic and onions somewere in the preparation. 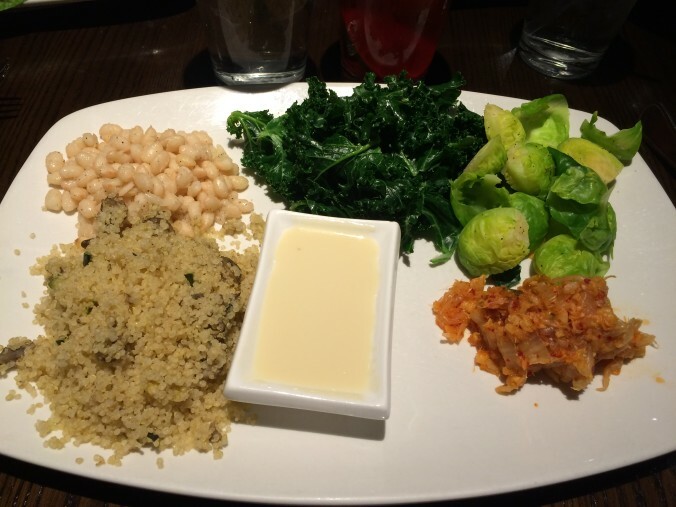 On my second visit, I resolved to consume fewer calories and ordered a decent squash soup and the warm quinoa veg plate. On the latter, the name proved as accurate and boring as the dish itself. I’m sure the chef would say it was my own fault. Meanwhile, my companions reveled in the menu’s delights: excellent steamed dumplings with cabbage, carrot, tofu and black mushrooms; crispy (read: deep fried) brussels sprouts; the sunflower burger; and the Kabocha squash ravioli. 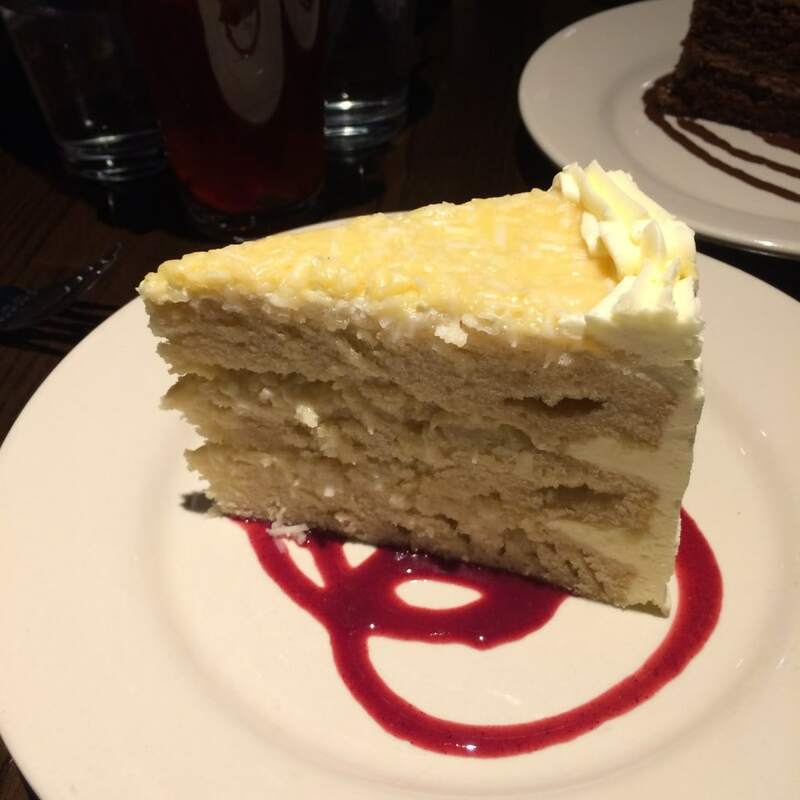 I felt so deprived that I wound up ordering a slice of their rich, dense, coconut cake and eating every crumb. Wonderful yes, but not a low fat outing. Is UberEats friendly to folks trying to lose weight? Getting lunch delivered sounds good, doesn’t it? 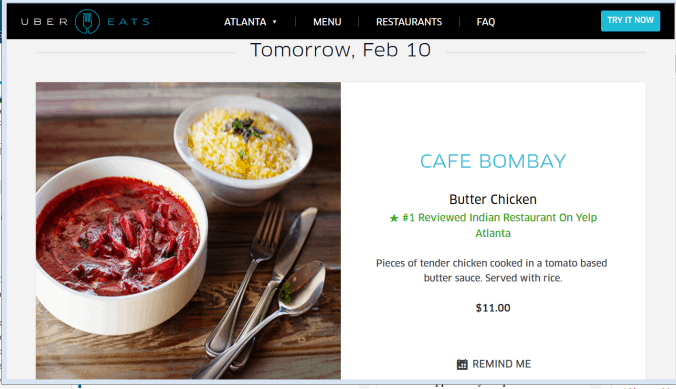 In the way that Uber has disrupted taxi and limo service, UberEats hopes to do so with lunch delivery. For folks on Weight Watchers or other dieters, there’s nothing to celebrate just yet. The service is available only in the most moneyed part of Atlanta — basically just south of downtown, up the Downtown Connector, and then up either Ga. 400 to Buckhead and I-85 almost to the Lindbergh area. So if you work in Decatur, you are plain out of luck. Open the Uber app and select the meal icon at the top. Enter your location and tap VIEW MENU. Place order and your meal will be curbside in minutes. For those trying to eat healthy, the menu choices are limited. 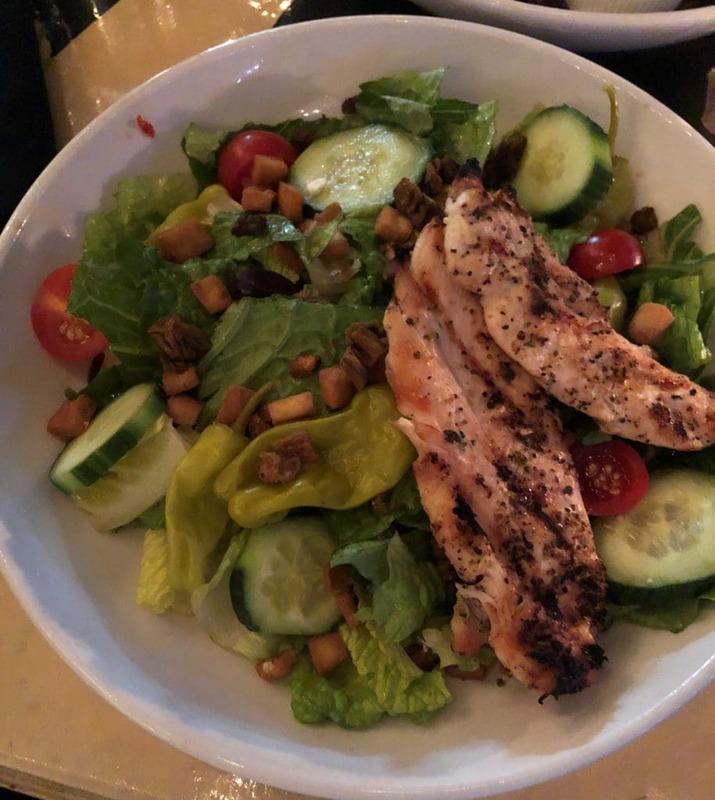 For example, nothing listed for Feb. 10 was particularly diet-friendly; for Feb. 12, there was an Asian salad that would be OK with the fried won tons removed and only a modest amount of the sesame dressing. Naturally, there is no fiddling with the menu or the way a dish is prepared. All you can do is watch the weekly offerings and hope for the best. 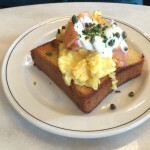 The website Eater just released its “National Eater 38: Where to Eat in 2016.” The list was compiled by Eater’s excellent critic, Bill Addison, whom I once tried to hire to write about restaurants for a major publication. Here’s my take on the three restaurants that I’ve sampled, two of them before The Restaurant Dieter launched. This place was high on the husband’s list, in part because it’s been honored and celebrated like there’s no tomorrow. The chef is Grant Achatz, who has the distinction of being this genius chef — who lost his sense of taste due to cancer. Really. You couldn’t make this up. Our meal consisted of like 19 itty-bitty tasting menu courses that might have been invented by a mad scientist. Each time one arrived, our helpful server explained precisely how to eat it. The little white ball in a green liquid was to be tossed back all at once, allowing the ball to collapse and merge its contents with the green liquid. Another dish was set on a pillow of scented air, which slowly deflated and added — we were told — to the sensory experience. Today I can’t remember a thing about the dishes, only the voluble instruction. I was so eager to try this restaurant for several reasons: One, the chef was Kevin Gillespie, whose food, whose aw-shucks geniality and ginger bear modesty made him the fan favorite on Bravo’s sixth season of “Top Chef.” Two, I’d eaten at his Woodfire Grill in Atlanta, which was excellent. 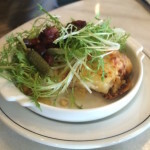 Three, the restaurant adopted a new serving style akin to Chinese dim sum. The cooks make the rounds with trays and carts; diners choose what looks good, as many or as few plates as they like. You might guess what happened: Our foursome wanted to taste everything, often taking more than one of each. We wound up eating way more than we should have — not good for one watching calorie intake carefully. When the bill arrived, it was more than $400 — without alcohol. Gulp. This was my second visit to one of Joel Robuchon’s restaurants; I’d visited its twin in Paris. 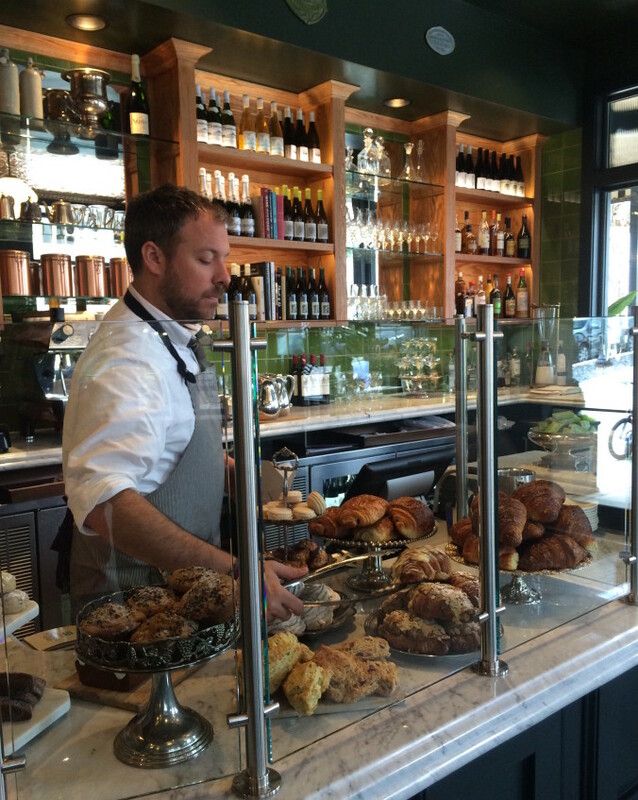 Both featured tasting menus, served at counters that offered a bird’s eye view of the kitchen doing the work. Every course was modest and crafted with considerable care. Were it not for the crusty French bread, it might have been a modestly healthy meal. But good bread is hard to resist. The full review is here. When Bread & Butterfly opened in Atlanta’s Inman Park neighborhood a month or so ago, The Atlanta Journal Constitution said it evoked “cozy Euro-style cafés, whether in Paris or Manhattan, with copper ceiling tiles, patterned floor tiles, marble accents and, of course, café tables.” Perhaps that’s why the portions are so small. That might seem like a lucky break for someone on Weight Watchers. The portion size at some American restaurants — Cheesecake Factory, for instance — often is gargantuan. But the portions here were so tiny that The Restaurant Dieter left hungry and just had an apple with some deli turkey. The only thing that emerged from the kitchen as a standard portion was pancakes that a friend ordered. The brunch menu has just 17 items. including two high-fat sides (frites and creamed kale) and marinated olives for $5. So it was a pretty limited menu. I opted for the three salads: marinated beets, celery root auvergne and lentils and mushrooms. 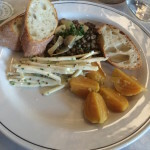 The dish came with three slices of baguette; 1/2 to 3/4 cup of lentils in a vinaigrette; a single beet; and celery root in a thin mayonnaise-based dressing. I figured 3 Weight Watchers Smart Points for the dressings and 4 for the lentils and left the bread. 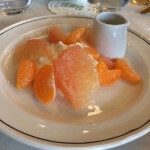 As a starter, I had the citrus with yogurt and honey. It consisted of a few grapefruit sections, a few clementine sections atop and honey on the side, as requested. It was a nice menu option, but again tiny. I counted it as the fruit (0 points) and 1/2 cup plain regular-fat yogurt (3 points). There’s no reason a 10-point meal should leave one hungry. But this one did. Topping it off, a friend asked for a skim milk latte. Answer: we don’t have it. The requested dinner menu never arrived, so no telling whether it’s any better later in the day. 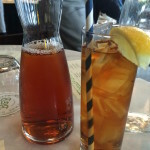 About the only high point was the iced tea, which came with a nice carafe for multiple refills. Later on, there will be some nitpicking about the menu. But let’s just start with the most important thing: Thanks to the in-theater dining trend, finally there is something besides movie popcorn, candy and liquid-cheese nachos to eat at the theater. For someone trying to eat healthy, it’s an improvement. The Wall Street Journal pegged the trend to trouble in the movie industry overall. Adding food was hoped to bring back adults, who have found the movies themselves lacking, it said. Both have menus that seem right off the Sysco truck, but that’s to be expected. They just need to have enough choices to satisfy most people without a lot of food waste or the need for high-end chefs to cook it. At the AMC Bulkhead 6, the menu actually had the calorie counts for each dish. OK, so calories alone don’t tell you much about the healthfulness of food, but at least it’s something. I had the grilled chicken quinoa, which clocked in at 720 calories. It was probably a cup-and-a-half of quinoa (9 points on the new Weight Watchers system), 3 ounces of grilled chicken (2 points), a quarter-cup slivered almonds (5 points), a quarter cup of feta cheese (4 points) and 3-4 tablespoons dressing (4-6 points). The asparagus and tomato amounted to 0 points, although one suspects there was some oil used in the roasting of the asparagus. All in all, it was a pretty expensive entree, points-wise. It was small enough that I found myself ordering the crispy brussels sprouts, which were listed at 230 calories. 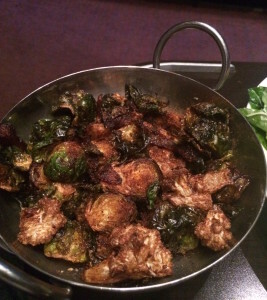 The 1 1/2 cups of brussels sprouts themselves would have been about 57 calories, so the rest of the calories came from being stuck in a deep fryer. Adding that was a mistake. As it was when I ordered it last night again at CineBistro. 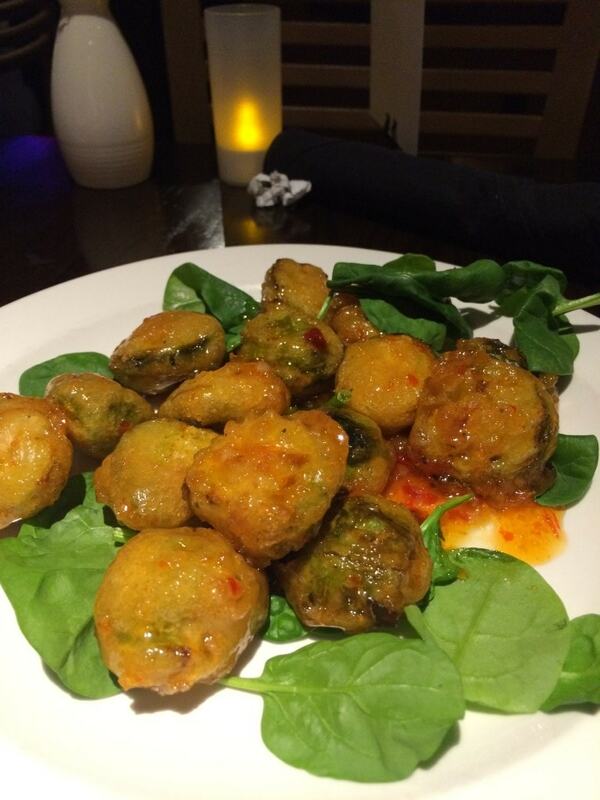 They are a favorite vegetable, but this whole trend of throwing them in a deep fryer doesn’t do them any favors. CineBistro’s menu is more varied and has greater ambitions: Moroccan lamb chop and fig-and-brie flatbread, for instance. That’s not necessarily a good thing. The Restaurant Dieter’s spouse has a rule of thumb: If you suspect that the kitchen’s ambitions exceed the likely skill, order the hamburger. He did just that, and I ordered the grilled chicken BLT, no B with a Caesar salad on the side instead of the fries. I left the bun and ate only the chicken and the Swiss cheese and smear of guacamole that came on it. 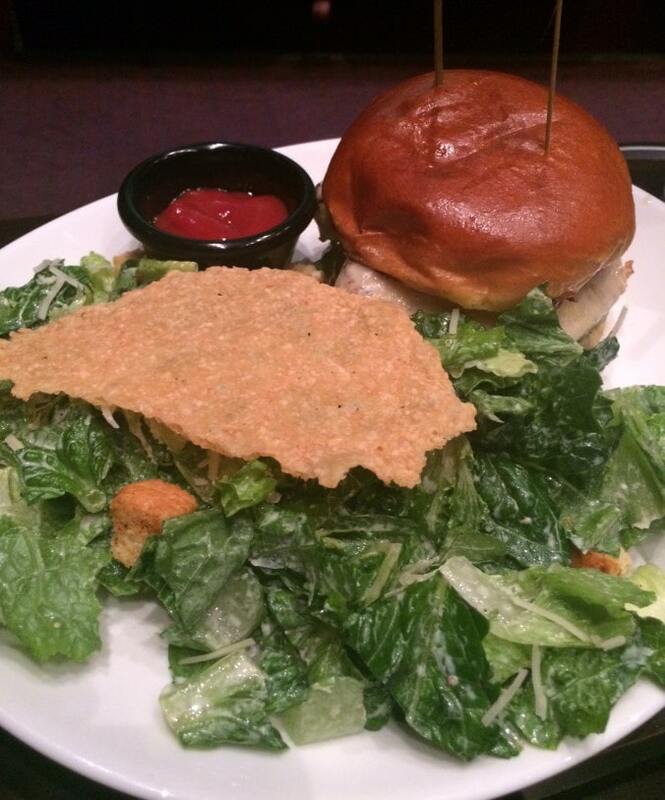 The salad was pretty lightly dressed, so I ate that too, leaving aside the huge, fried cracker of parmesan that came on top. With the unfortunate crispy sprouts, neither meal was exactly a nutritional or diet winner. On the other hand, it beats a nutritionally vapid tub of “buttered” movie popcorn and giant package of Twizlers. Sometimes, a guy’s got to eat. Choosing carefully based on your desires or diet isn’t practical. So you wind up with what’s close by — in this case,close by the Tara Cinema in Atlanta. So we found ourselves at Rain, which bills itself as a “Thai and sushi bar.” The menu spanned at least 6 pages, all with photos, with enough decent choices. The nutritional bargain for me was the lemongrass soup. Hunting around on the web, I found what I think is the basic nutritional information. I counted it as 4 Weight Watchers points. The big, hulking former Sears, Roebuck & Co. building on Ponce de Leon has become Ponce City Market. What sat nearly vacant for many years is a collection of pricey condos, pricey shops and upscale restaurants. The restaurants include several by well-known Atlanta restauranteurs plus Brezza Cecina from noted chef Jonathan Waxman. The whole market is a buzzy new space in Atlanta, and as the largest restaurant, Brezza Cecina is the buzziest. Even on the Friday before Christmas, it was wall-to-wall young professionals. Most were too svelte to care about watching caloric intake, but that is The Restaurant Dieter’s lot. And Brezza Cecina accommodated nicely. From the single-page menu, my non-dieting friend got a huge serving of butternut squash risotto that would kill any diet. I , too, left satisfied, thanks to some luck and guidance from a great server. He recommended the kale salad lightly dressed, which was fine. But the best bet was the verdure salad, full of roasted vegetables in a light dressing. I got the remains of my husband’s and shared with a friend. We ended up ordering a second. Then the roast chicken was another good recommendation.